I received a review copy of this book back in June, which was followed by a note a bit later in a Fight Club like tone that I was not to talk about the book until a month before publication. Which is in about a month from now. More or less. Kate Atkinson’s Life After Life is one of my favourite novels. Nietzsche and Kierkegaard are two favourite philosophers. Groundhog Day is one of my favourite films. But enough about me. In 7½ Deaths Aiden Bishop is stuck in a loop he cannot escape until he solves the murder of Evelyn Hardcastle. The twist is that he lives the same day seven times from seven points of view and if he cannot solve the murder then he has to start all over again, with no memory of the previous attempt. It’s a new twist on an old idea. Why 7½ deaths? It seems the half was added due to some confusion in the US around this and The Seven Husbands of Evelyn Hugo because I know how simple it is to confuse husband with death…. I liked this book’s gothic elements and its relatively fresh take on the repetition concept. Unfortunately, I just did not like Aiden Bishop very much for no particular reasons I can give without spoilers, and I found the conclusion a bit dissatisfying. That said, it a pretty great debut novel from Stuart Turton, and I will look forward to more work from him. There’s this park in Hastings Sunrise that has, I think, one of the nicest views in the city. This photo doesn’t do it justice obviously. 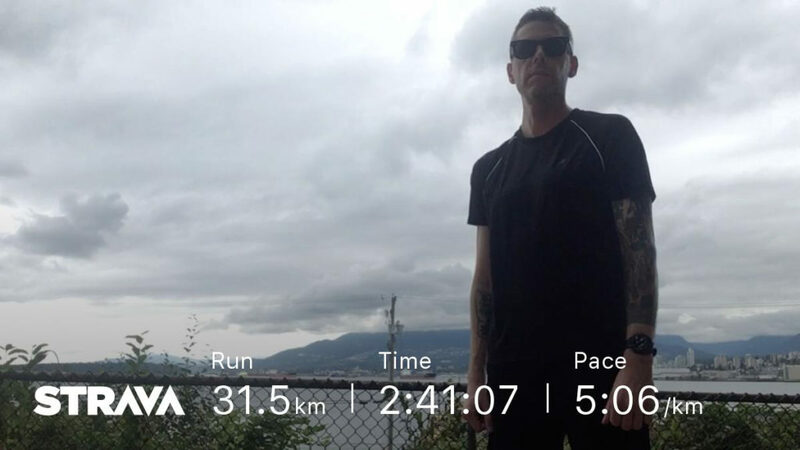 Yesterday was long run number three on the road to my BQ at the Victoria Marathon in October. I set out to run 32KM and decided to mix it up a bit; rather than a long, slow, slog I would run 5KM easy and then 5KM at race pace and repeat that three times, then finish with a 1KM sprint and a 1KM jog home. But by 30KM there was nothing left to sprint 1KM so the final jog ended up being a little less under a mile. Afterwards analysis and all in all it went pretty well. My goal race pace for Victoria is 4:37/KM. My first five at race pace I managed to average 4:38/KM, second at 4:31, and the third was right on 4:37. I had no idea at the time; I felt like my pacing was all over the place. And it was to a degree, but it all averaged out in the end. So that felt good, even if not much else did. I spent a few hours afterwards thinking about my long runs last year while training for my first marathon and trying to remember if at the end of them I wanted to die then, too. If that’s the case, and I’m sure [hopeful] that it is, I seem to have blocked that part out. Eight weeks to go.